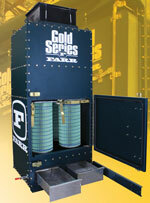 Farr’s Gold Series GS4M Mini dust collector controls emissions from small airflow applications up to 2,000 cfm. The collector is a pre-wired unit with a low-noise fan (less than 70 dB), controls, motor starter, filters and cleaning system. It contains four HemiPleat® flame-retardant filter cartridges with 788 square feet of media. The automatic, reverse-pulse cleaning system is activated by an on-demand control panel. A safety monitoring filter is included to allow recirculation of the filtered air downstream for energy savings.